Kerry Gems Kerry has some of the finest diving beneath the Atlantic waves. 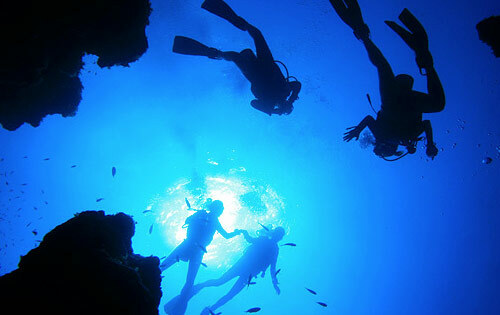 Kerry has some of the finest diving in the world and beneath the Atlantic waves. Last summer I did something that I never thought I’d do, I went scuba diving at Waterworld in the Maharees and it was without doubt one of the most amazing things I’ve done in my life. I had know about their ‘Try a Dive’ for many years but was aprehensive about doing it. To be honest, that morning I was thinking maybe I’m going out of my depth here in every sense but I need not have worried. I first went through a safety questionnaire and luckily I was able to say ‘no’ to all the questions about breathing difficulties or asthma problems. Then I had two hours of instruction in the pool, going through all the safety drills before going to the sea. There are the most amazingly clear waters around the Kerry coast. We seriously under-utilise our own resources. My instructor, a very friendly and competent young man named Philip Steen, he had come from Sweden to scuba dive here and the two other people in the course were from Japan. Anyway, once I had got familiar with the equipment and safety procedures we headed for the sea. This was really amazing. The visibility was excellent and at one stage shafts of sunlight lit up the forest of seaweed and showed all their different colours. It was just amazing to be swimming along side some wonderful fish. Some of the fish were spectacular, like the Shanny fish in the sand that take their colour from the background or the really big Hermit Crabs. I would highly recommend anyone who is comfortable in water to try Waterworld’s ‘Try a Dive’. This would be an ideal present to celebrate a special occasion like a 21st or whatever. Sandra Fitzgibbion told me of a 74-year-old man who had recently completed the dive course.